A big debate over a little person is getting a new perspective after recent analysis of prehistoric teeth. Scientists now suggest that the remains of Homo floresiensis , popularly known as the Hobbit, seem to show it belonged to a unique species of hominin, rather than being a modern human with a physical deformities. The features of the teeth were found to be “most similar to specimens of Homo erectus , the earliest undisputed ancestor of modern humans, from the Indonesian island of Java. However, H. erectus was about as tall as modern humans. The scientists suggest that on isolated islands, the ancestors of the hobbit underwent dramatic dwarfism, with their bodies shrinking from about 5.4 feet (1.65 m) to 3.6 feet (1.1 m), and brains dwindling from about 52 cubic inches (860 cubic centimeters) to 26 cubic inches (426 cubic cm),” writes LiveScience. 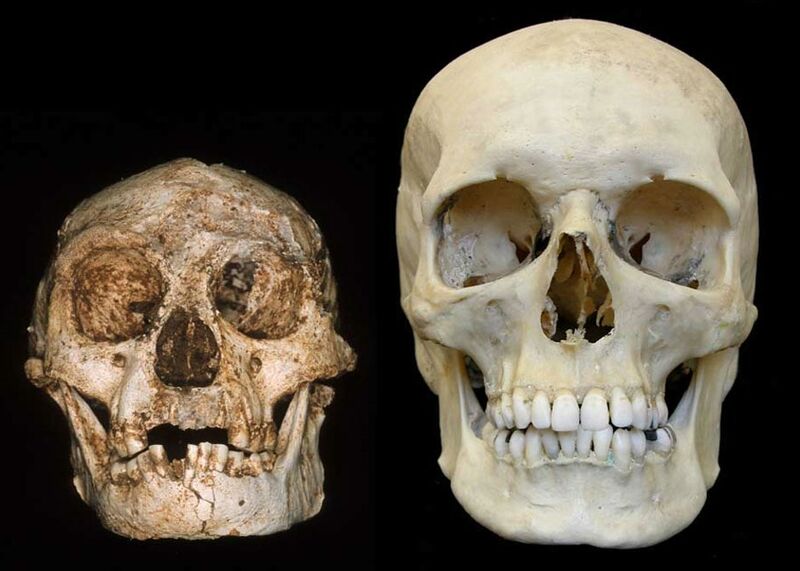 Skull belonging to Homo floresiensis, which Chris Stringer believes is more similar to the Australopithecus genus. ( Wikipedia). The first ever comprehensive analysis of Hobbit teeth, as published in science journal PLOS ONE , reveals that their unique shape shows the ancient humans were part primitive and part modern. The analysis goes against previous theories that the Hobbit had teeth exactly like modern humans, and therefore were merely an enclave of people who suffered from microcephaly, a rare neurological condition resulting in an abnormally small head, a small body and developmental issues. Their canine teeth possessed an asymmetrical shape, and their molars had only four cusps – not the five found on teeth of most primitive humans. The diminutive hominin, nicknamed ‘Hobbit’ for its small stature, was estimated to have stood at a height of around 3.6 feet (1.1 meters). The Hobbit was first discovered in October 2004, when an excavation of fragmentary skeletal remains from the island of Flores in Indonesia yielded what was called “the most important find in human evolution for 100 years.” Its discoverers classified the find as Homo floresiensis , a name suggesting a previously unknown species, dated to have lived between 95,000 and 17,000 years ago, meaning the Hobbit lived at the same time has modern humans and may have been the latest surviving human species, aside from our own. This controversial find spurred fierce debates. Multiple studies laid down many differing theories as to the origins and status of the prehistoric beings. A report published last year claimed that the fossilized remains found in Liang Bua cave on Flores contain important features most consistent with a diagnosis of Down syndrome, including a short thighbone and asymmetrical skull formations. However, the conclusions caused an immediate backlash from scientists around the world. The prehistoric people went extinct approximately 13,000 years ago, but as with the disappearance of the Neanderthals, no one knows for certainly why. “I think it is quite possible that they met with early modern humans, who expanded from Africa into Australia around 50,000 years ago,” Dr Kaifu said. Though the origins of the Hobbit is slowly being uncovered, scientists still do not have a clear picture as to the fate of the small people. ABC News writes that some wonder if our species wiped them out through disease or warfare. Or were they simply absorbed into the larger Homo sapiens population? It is speculated it may even be possible that people today carry some hobbit genetics. The ongoing international debate over the bones of the Hobbit tells us many things not only about humanity’s ancient origins, but also about the scientists who reconstruct it, suggests ABC News. Further research may give us answers into the ultimate fate of our ancient cousins, the Hobbits. ETA. Because of a diet similar to ours some ape species could have been wiped out by early humans. I would think there were various sub-species of ancient human in the same way there are sub-species of most if not all other species. Some human sub-species may have perished because they were too small a population to survive but I think most will have been wiped out by our earlier ancestors. I'm convinced Neanderthals were wiped out by Cro-Magnon. One anthropologist said it seems unlikely so many ancient skulls said to be human ancestors can all be human ancestors, or likely others would still be with us (too widespread for ancient genocide). Many are probably ancestors of extinct upright apes. We can only have a few ancestral lines, not so many.